Nothing can make a trip to Paris or anywhere in France more enjoyable and rewarding than a great dining experience - but you have to know what to order This handy guide helps readers navigate French menus while also steering people to some great restaurants in each country. The bulk of the book is the most comprehensive menu reader available, translating thousands of French words and unique French and Parisian dining terms into English. 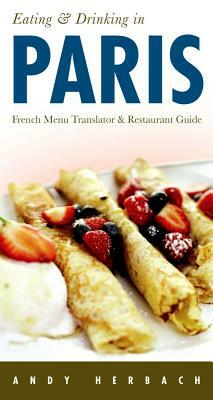 There are also sections on restaurant etiquette, a pronunciation guide, and English-to-French phrases and words. Andy Herbach is a lawyer and professional travel writer. He is the author of Open Road's 'Eating & Drinking' menu-translator guides to Paris and Italy, and is also the author of "Open Road's Best of Paris" and "Open Road's Best of Provence & The French Riviera."